The Grundo Warehouse, located at the Space Station, is a massively large warehouse that contains virtual items waiting to be claimed by Neopians. Most real life Neopets merchandise comes complete with a Rare Item Code (often referred to as RICs). These codes can be entered into the Grundo Warehouse and you'll get an item in return! Most of the item prizes are only available from codes, so they can fetch a nice amount of Neopoints. Where Can I Get A Rare Item Code? Rare Item Codes are printed on the tags of Neopets merchandise; to check what merchandise is available in your area then take a look at the shopping catalogue (just make sure that you have the correct country listed in your user info, as this may affect which items will show up for you - some items are only available in certain countries!). The main source at the moment are plushies, but they also come in packs of Neopets TCG. To redeem a TCG code, you need to go here. Codes also come from certain mystery capsules from the NC Mall. To see which ones offer a code, click here. Note: A Rare Item Code can only be redeemed once and once only. There have been scams floating around the Neoboards where users would try and "sell" Rare Item Codes to others in exchange for Neopoints. In most of these cases, the scammer had already redeemed the code themselves and claimed the item from it, thereby making it useless, and the hapless Neopian who "bought" the code from them was left with nothing but a string of random letters and numbers and the feeling of being cheated. So Are All People Giving Away Codes Scammers? Not all of them, no. Some people do genuinely give out codes on the Neoboards to other users who can't purchase one for themselves (usually because the merchandise isn't sold in their country); this is most commonly seen on the Avatar & Neosignatures Board. However, these people won't ask you to pay them for the code, mainly because asking for such a payment is against Neopets' rules. They will, though, ask you to send them the item you received from redeeming the code, which is just good manners really since they paid for the merchandise the code came with. Why would you want to redeem a code if you don't get to keep the item? Read on and all will be revealed! What Do I Get When I Redeem My Code? For the first code (from real life merchandise or mystery capsules) that you redeem, you'll get the Space Faerie as a Battledome challenger! This is the only way to get her as an opponent, and you definitely want her because defeating her earns you a spiffy avatar as well. For every other code you redeem, you will receive a random prize. Neopets will sometimes have special promo codes that can be entered into the Warehouse. Since these codes are not attached to Neopets merchandise, you cannot get the Space Faerie challenger from them. But you can get some cool items. The most notable promo codes are from Neopets' Facebook page, given out as a reward for reaching a certain number of fans. Other special occasions (the Altador Cup, San Diego Comic-Con, etc.) might also prompt the giving away of codes. To view the prizes and their codes, use this Item Database search. Isn't There Another Avatar I Can Get From Here? Yes, yes there is; go to the top of the class. 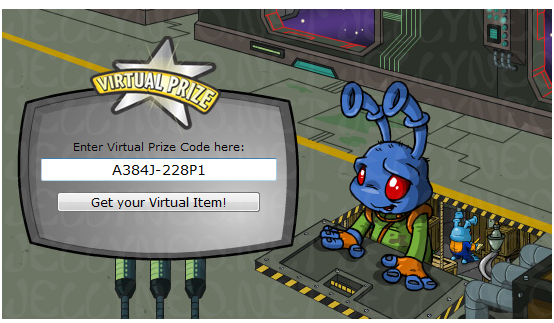 :) The avatar directly available from the Grundo Warehouse can be achieved by entering the code A384J-228P1 into the Virtual Prize Code box. Once you have entered the code, hit "Get your virtual item" and you will receive the avatar. In case you were wondering (because I know that you were), the code comes from the Grundo Warehouse TCG card, as was discovered by a couple of very avid avatar collectors. Defeat the Space Faerie in the Battledome.